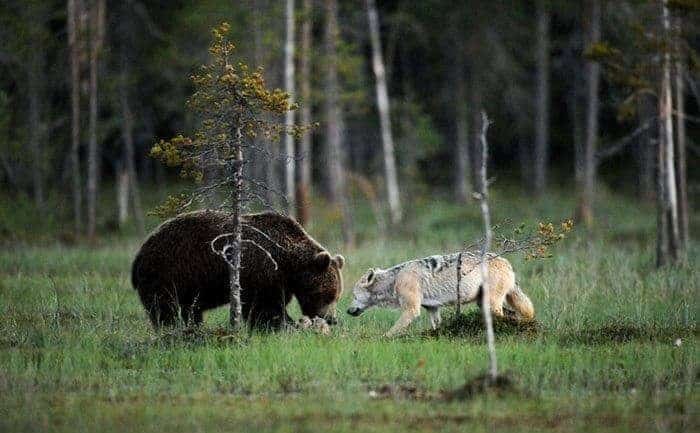 The finnish photographer Lassi Rautiainen spotted an unusual get-togeher during his tours through the wild finnish countryside. His first thoughts were that he just captured a random encounter of a wolf and a bear and that they are just tolerating the other one for the moment but he soon observed that those two spend more and more time together playing and even hunting together. The tale of two Wolves – which one wins? let’s work it out before we wipe it out! How extraordinary! However I hope wolf hunting in Finland will be curbed.